JR RHP Anthony Ranaudo (2010) has been likened to fellow Tiger Ben McDonald, but, while the similarity works in a lot of ways (both highly touted 6-7 Bayou Bengals), the comparison is more about shiny new toy syndrome and short memories than anything substantial. Ben McDonald was a phenomenal prospect coming out of school in 1989. Anthony Ranaudo is a very good prospect here in 2010. Big difference, although hardly an automatic strike against Ranaudo’s prospect stock. I guess all of this is self-evident (Ranaudo isn’t McDonald, what a revelation! 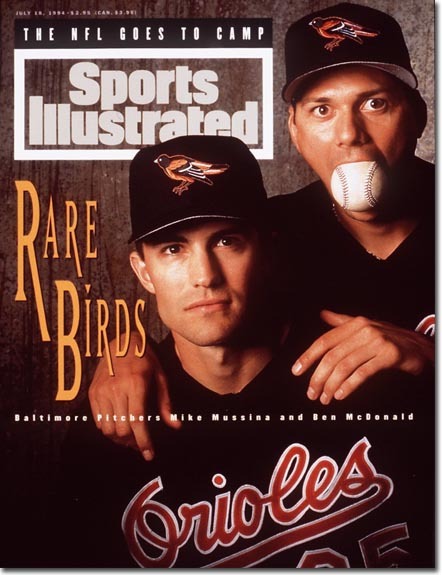 ), but I’ll be honest here – this whole paragraph was nothing more than a front for showing off one of my favorite SI covers of all time. Makes me laugh every time. Anyway, everybody saw Ranaudo when he was at his relative worst, when he was completely worn down and exhibiting diminished velocity during the College World Series. His heater was sitting only in the upper-80s and the sharpness on his 12-6 curveball, the secondary offering generally considered his finest, was noticeably absent. I caught Ranaudo for the first time during the middle of conference play last season and came away impressed. His fastball was 91-93 MPH consistently, hitting as high as 94 at its peak. Many outlets regard his curve as a superior pitch to his change, but Ranaudo’s 82-84 MPH sinking changeup impressed as much as his high-70s curve, a pitch that flattened out too often and stayed consistently up in the zone. In fact, that’s one of my biggest concerns about Ranaudo going forward. When he misses, he misses up. the one thing I’d love to see first addressed with Ranaudo as a professional is his tendency to leave balls up. Darn near everything he threw, especially his fastballs and curves, were left up. Ranaudo is 6-7, 220 pounds and should be able to us e his frame to his advantage when attempting to generate a more favorable downward plane on his pitches. In fact, don’t be shocked to hear many of the experts assume that the big righty gets that great downward movement and the ensuing groundball outs that come with it. It’s a fine theory and one that will be correct more often than not, but in this instance it’s wrong. My quick 2009 GO/AO ratio using the publicly available data for Ranaudo is 0.71. That number would be best compared against all pitchers that make up the college ball landscape, but, alas, we’re stuck making an assumption of our own in lieu of spending far too much time and energy ginning up all that data. The assumption here is that 0.71, a number that more or less says Ranaudo induced 100 air outs for every 71 groundball out, makes the big LSU righty a pretty clear flyball pitcher. All of the “non-skill” stuff with Ranaudo grades out as excellent. He gets high praise for his competitive makeup, he is an above-average athlete who prides himself on staying in tremendous baseball shape, and the LSU coaching staff has widely acknowledged his receptiveness to learning as much as possible about what it takes to be a big game pitcher. He had a healthy sophomore year, but it is still possible questions linger in the minds of clubs worried about the two missed months his freshman year due to tendinitis in his right elbow. Another season of healthy, dominant baseball in the SEC should solidify his spot in the top ten. JR OF Chad Jones (2010) is a problem for me. It is very easy for me to get in the habit of being too darn positive about these prospects because it is more fun to think about upside and ceilings and perfect world projections while ignoring the nasty reality that so many little things can go wrong to torpedo any given player’s prospect stock between now and June. I try my best to be mean, to find red flags about players I know I’m overrating based on upside. Chad Jones probably should be one of those red flag players because, logically at least, there has to be at least a couple tools duds sprinkled into this star packed LSU outfield. Mahtook, Landry, Watkins, Dishon, Dean, and Jones all can’t be serious big league prospects, can they? Watkins is the speed guy, Dean is the well-rounded senior masher, but Mahtook, Landry, Dishon, and Jones are all big-time projection guys cut from the same ultra-toolsy cloth. Of those four, Jones is probably the best athlete. To take it a step further, Jones may actually be the most unbelievable athlete of the entire 2010 college class. He has great size, speed, and strength with a definite plus arm and above-average power potential. I put him in the same class as Jake Locker last year, for better or worse. Each player has enormous untapped potential on the diamond (for better!) which, unfortunately for baseball fans, may forever go untapped due to the presence of football (for worse…). There are so many questions surrounding Jones heading into his baseball season that is quite difficult to even place a draft value on him. Does he even play baseball this year for LSU? If so, will he actually attempt to play while simultaneously prepping for the NFL Draft Combine and pre-draft workouts? If he sticks with baseball, is his future brighter in the field or on the mound? Does he put it all off and stick another year out at LSU just to make us ask all of these questions again a year from now? The word is that his first love is baseball, but there are undeniable advantages in taking a top three round NFL signing bonus while keeping the possibility of baseball in your back pocket just in case. It should be fun following Jones whichever path he chooses…assuming he makes the right choice and chooses baseball, of course. That’s a joke…mostly. JR C Micah Gibbs (2010) is currently a potential late first round pick who, even with a subpar junior season, still ought to hear his name called in the first three rounds of the 2010 Draft. Offensively he is more solid than spectacular, though his plate discipline (career 69/76 BB/K ratio) is a skill worth getting somewhat excited about. Scouts have long pegged him as a player with big raw power, especially from the left side, but in two years at LSU he hasn’t been able to show off that batting practice thunder in game situations. Gibbs’ leadership is praised far and wide and his defense is beyond reproach, so expect Gibbs to get a ton of ink as one the chosen players MLB decides to “talk up” with positive press heading into the June draft. JR RHP Austin Ross (2010) is the prototypical four-seamer/sinker/slider guy. He occasionally expands upon the repertoire by branching out with a show-me change, but otherwise remains true to his sinking 90-92 fastball and solid slider with plus potential. He has excellent command of all of his pitches, most notably the four-seamer and the sinker. In addition to solid present value stuff, Ross has excellent mechanics and room to grow on his lanky 6-2, 190 pound frame. I group college pitching prospects into a couple of different categories. Ross will likely go in with the rest of the “potential back of the rotation arms” because he has the makings of at least three big league average or better pitches. SO OF Johnny Dishon (2010) is yet another legit well-rounded five-tool talent. He has above-average speed, a plus arm, plays a good enough centerfield (though he fits best in right professionally), and has a really promising hit tool. After redshirting last season, he finds himself draft-eligible in 2010, but, and I’m sure a pretty clear theme is developing here, he has plenty to prove this upcoming season. Dishon heads into the season as LSU’s fourth outfielder, a testament to this team’s crazy outfield depth. At this point I consider Dishon to be one of the most underrated prospects in college baseball. He still swings and misses too often, but his base running is top notch and the pop in his bat could grow into real power with more reps.
SR 1B/OF Blake Dean (2010) is being counted on to start the season as LSU’s primary first baseman even after getting beat up on the operating table (torn labrum and appendectomy) this past offseason. Reports on his defense at first have been extremely positive so far. I liked Dean as a prospect a lot last year, but with every extra year (and every subsequent injury) spent not developing his craft professionally it gets harder and harder to envision Dean ever holding down a starting job in the bigs. His good but not great future with the bat makes me wonder if his overall package is going to be able to carry him at a defensive position like first base that demands more than just a good bat. Getting back into the outfield at some point this season (even if only doing so pre-game for scouts on hand) would be a very, very good thing for Dean’s prospect stock. As is, he represents value as a potential money saving senior sign option (with upside, no less) between rounds five and ten. JR RHP Daniel Bradshaw (2010) is probably the better comp to Louis Coleman on the roster, but with stuff that grades out lower across the board. Bradshaw sits 86-90 with the fastball and throws a couple of average at best offspeed pitches (curveball and changeup). His lack of dominating, or even above-average, stuff dim the shine of his pro prospects, but he’ll at least have the benefit of spending two more years at a hugely respected college program to build up his draft resume. As a senior sign in 2011, he could get a real look, but I don’t see him getting picked high enough in 2010 to leave school early. Then again, he could also put together a fine season as LSU’s Saturday starter in 2010 and have us all reconsidering his future come June. SR OF/1B Matt Gaudet (2010) is a player that finally helps answer the question what would a baseball player with severe sfairesphobia look like out in the field. In other, non-bastardized Greek words, Gaudet is a bit of a butcher defensively. His raw power is impressive, but he has a lot to prove after sitting out the 2009 season and, unfortunately for him, not a lot of time to do it. He is currently slated to be LSU’s righthanded hitting half of their designated hitter platoon. JR 1B Kyle Koeneman (2010) has been both a highly decorated prospect coming out of high school (2007) and a well regarded junior college power hitter (2008-2009) who was very surprisingly bypassed in all three of his draft years. He has massive playable power and is capable of playing the outfield corners if needed. At bats will be hard to come by for Koeneman, but it’ll be interesting to see how he adapts to a bench role as that will almost certainly be his role if he can hack it in pro ball. JR RHP Ben Alsup (2010) is in line to fill the all-important role of swingman of this year’s LSU staff. His low-90s fastball, above-average athleticism, and projectable 6-3, 160 pound frame all remind me of another pitcher formerly in the program that often saved the bullpen with multiple inning outings, Louis Coleman. JR C Edmond Sparks (2010) has a plus arm and is solid behind the plate, but right now his bat still lags behind his defense. His track record in junior college shows a player slowly beginning to tap into his gap power potential, but he still needs to show something on the big college baseball stage. He didn’t get nearly as many at bats in 2009 at Chipola as he did in 2008 (not sure why), but he figures to get some actual time as Gibbs’ backup in 2010. JR SS Mike Lowery (2010) is out for the year as he recovers from back surgery. SO OF Mikie Mahtook (2011) projects to do just about everything well at the big league level. His tools all grade out as above-average or better, but the gap between where some of his skills currently are and where they ultimately need to be is substantial. Mahtook has made steady progress narrowing that gap since enrolling at LSU, but his performance this spring will be heavily scrutinized by scouts expecting big things out of the potential 2011 first rounder. Mahtook is a plus athlete with above-average raw power, above-average speed, a strong arm, and the potential to play an above-average centerfield as a professional. SO OF Trey Watkins (2011) can run like the dickens. That’s fast. You know it’s fast because it prompted me to say something like he can run like the dickens. That’s not a phrase I’m willing to use publicly unless it was oh so true. Watkins’s plus-plus running ability allows him to cover huge chunks of ground in the field. His compact 5-8, 190 pound frame is very well proportioned with those explosive fast twitch muscles that make the eyes of scouts widen. I know this is a cop-out, but Watkins is a player you really need to watch play to understand. His upside could be Bobby Abreu with more speed and less home run power. JR OF Tyler Holt (2010) of Florida State is the best current prospect comp (although Holt strikes out a lot more) I can come up with; Holt is draft-eligible this year, so it’ll be interesting to see if his draft standing works as a litmus test to Watkins’s 2011 draft stock. SO RHP Shane Riedie (2011) is on tap to be LSU’s early mid-week starter this season. He’s a really big kid (6-5, 240) that was worked really hard in high school, but has serious potential as a hard throwing innings eater type if it all comes together. Riedie’s fastball currently sits in the high-80s, but he can dial it up to the low-90s (I’ve seen him at 94) on occasion. That velocity should jump with time, perhaps as soon as this upcoming season. There are already reports from the summer saying he was sitting more comfortably in the low-90s, a fantastic sign for his development. The increased emphasis on high level conditioning, refinement in his mechanics (seems like he has a bit of a hitch in his delivery and it looks like he drags his throwing arm across his body more than most scouts like, plus his lower leg kick isn’t as high as I personally like to see) and more professional LSU throwing program (compared to what he did in high school) should continue to do wonders for his arm. Riedie’s best pitch is currently that high upside fastball, but his curve is already a solid second offering. His changeup is a work in progress, but the fact he has shown it in game situations (largely over the summer) is a good sign for its development. Riedie isn’t Anthony Ranaudo, but he isn’t so far off that the comparison is totally crazy. SO RHP Matty Ott (2011) is exactly the kind of player that makes following the sport fun. He somehow pulls off always appearing both fiery and cool while on the mound, he gets big time results (69 K to 6 BB in 50.1 IP ) through unconventional means (his funky low ¾ delivery is only a hair or two from dropping officially down to sidearm), and he is by all accounts a wonderful example of what a student-athlete ought to be. His hard, sinking high-80s fastball works really well in concert with a high-70s big league ready slider that makes life miserable for both lefties and righties alike. Ott’s prospect stock is in limbo because he doesn’t fit any kind of traditional baseball archetype. He hasn’t currently shown the stuff needed to start (although I’ll happily go on record in saying I think he’d blossom if given the opportunity to refine a third pitch), and he doesn’t have the knockout fastball that so many teams require out of their late inning aces. Maybe it is a personal blind spot of mine, but, archetypes be damned, I like players like Ott that get just get guys out. He has two big league pitches at present (fastball is a little short, but the movement bumps it up a grade) and has time to polish up a third offering. He won’t be a first rounder, heck he may not even be a candidate to go in the top 150 or so picks, but he could wind up his college career as a high floor, close to the majors kind of prospect. If you read this thing regularly you know I value upside and star potential very highly, but in a world that Brandon Lyon can get a $15 million contract, you’d better believe there is value in locking in a player like Ott for six cost-controlled big league years. RS FR 3B Wet Delatte (2011) is…wait…his name is Wet? I mean, sure, his real name is William, but he willingly goes by the name Wet. I have a pretty simple rule on this site: any player named Wet moves up 50 spots on the big board automatically. Wet is already a decent defender at third and a gifted natural hitter. He’ll get his chance as LSU’s staring third baseman heading into the spring. SO 2B Tyler Hanover (2011) is actually a very similar player to his double play partner Austin Nola. Hanover has more pop than his 5-6, 163 pound frame suggests, but like Nola, he is a very good defender at his position. He is also capable of playing third base and is expected to be first in line at shortstop if anything happens to Nola. The natural comparison is to fellow tiny infielder David Eckstein, but the numbers don’t back it up. As of now, Hanover is a fairly unique player who could see his career go in any number of ways before his draft year comes up. RS FR INF Beau Didier (2011) was drafted in the 40th round in 2008. Pittsburgh sure seems to have a thing for high school recruits committed to LSU, huh? Didier is the one who got away from the Pirates back in 2008, a loss that could sting over time. Didier has above-average power potential, but his recovery from Tommy John surgery has pushed the timetable back on the development of many of his skills. As a prep player Didier was known for having a laser rocket arm. It’ll be interesting to see if his recovery from the surgery was successful enough to allow him to throw like he once did. He is slated to start 2010 as one half of LSU’s designated hitter platoon, but is also capable of playing third and second. There are also quiet rumblings that many on staff think he would work best behind the plate. I think I’d like to see that as it would be a hoot to see LSU attempt to be the first team to attempt to field the first ever all catcher starting eight. I’m personally very curious to see how Didier responds defensively at the hot corner because people I’ve talked to have me believing he has enough range and good enough hands to stick at shortstop if given the chance. Didier isn’t draft eligible until 2011, but anytime a player has a family member with a scouting background its fun to begin to try to connect the dots. Those familial ties bind him to the Texas Rangers, so store that player to team link in your brain and we can revisit it about two years from now. SO SS Austin Nola (2011) gained notoriety during LSU’s championship run last season as a damn fine defender with an above-average arm. He showed just barely enough with the bat (.240/.350/.364 as a freshman in the SEC isn’t awful) to make him an interesting all-around prospect to watch going forward, rather than just another all glove, small bat player. Even if he doesn’t progress at the plate, he could still have himself a pro career. As the market for good defense continues to grow, players like Nola will likely see their draft stock get a boost. I also can’t be the only one who likes having a player on the premier baseball university in Louisiana with the last name “Nola,” right? 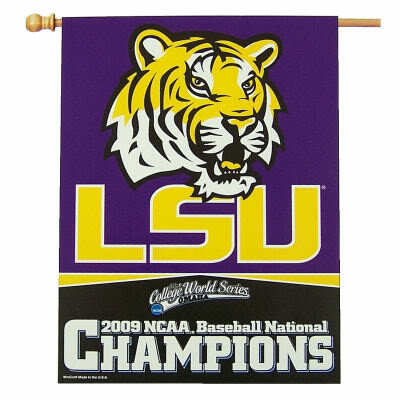 I know LSU is in Baton Rouge and not New Orleans, but it still feels right. SO INF Grant Dozar (2011) impressed those who saw him practice with the team last season, but didn’t get enough at bats in 2009 to make any conclusions about what kind of player he’ll be on the college level. As of now, he is expected to see time at both first and third. If he can earn some playing time behind the plate, as some have speculated he might, the added versatility would give this under the radar prospect a chance to get a little recognition. FR LHP Forrest Garrett (2012) was written up as a late round 2009 draft sleeper back in June, something I had forgotten all about until doing some of my very scientific research (Google) on Garrett. I won’t quote myself, but I will sum up my thoughts on Garrett here: gigantic sleeper with early round potential in 2012 because of great physical projection, high-80s to low-90s fastball with room to grow, present above-above changeup that should be plus pitch in time, above-average potential with curve, and solid command already. FR C Wes Luquette (2012) put up titanic numbers as a prep quarterback for the Manning brothers’ alma mater Newman HS in New Orleans, but comes to LSU as a backup catcher with the inside track on succeeding Micah Gibbs. His strong commitment to LSU coupled with pesky reconstructive elbow surgery back in February dropped him to the Pirates in the 27th round in 2009, but he could see his stock shoot way up by 2012, especially if he establishes himself as worthy of a starting spot by 2011. It’ll be an uphill climb for Luquette due to the ever-increasing likelihood of him sitting out the season to recovery from Tommy John surgery, but he is still in good shape of becoming a two year starter at LSU. FR C/INF/OF Mason Katz (2012) has some serious thunder in his bat for a smaller player. I’ve heard the coaches are excited about his ability to play multiple spots around the diamond, a big plus for a college team short on scholarships. However, I’ve also been told that his best position may eventually be “batter’s box.” I can’t honestly say whether that’s high praise for what his bat may become or an indictment of his handiwork with the leather. By Rob Ozga in 2010 College Team Profiles, 2010 MLB Draft, 2011 MLB Draft, 2012 MLB Draft, College Team Profiles on 21 Dec 2009 . Hey, so it appears that I forgot to add the pitchers to this list. Probably for the best since it was plenty long as is. Expect to see the list of the best arms LSU has to offer in the coming days. Hey, I recently found this blog – thank you for the good work. I wanted to inform you that it’s not showing up properly on the BlackBerry Browser (I have a Bold). Either way, I’m now on the RSS feed on my home PC, so thanks again! This is an in depth article – this could seriously be in SI. Hi again, I posted about one year ago saying that I wasn’t able to view your articles correctly. I don’t know if you edited your blog but I can now read it properly, thank you. I’m using a BB Tour. Awesome news! I remember your original comment and apologize for not getting back to you…by the time I saw it, so much time had gone by that I wasn’t sure if a response would do you any good. No clue how things were fixed, but I’m glad that they are. Thanks for alerting me to the issue in the first place.